Most people may not realize the extent to which everyday household objects pose threats to the safety of young children. When infants and toddlers are moving about a house, however, their curiosity, lack of body control, and naiveté may lead to serious accidents involving seemingly harmless items. The Consumer Product Safety Commission (CPSC) considers the dangers of window cords to be among the top five hidden hazards in the average home. Though strangulation is the most common hazard associated with window cords, these cords may pose a choking hazard, as well. Young children, particularly those who are teething, have a tendency to put nearly everything they find into their mouths. If a ribbon or cord travels far enough into the throat of a young child, the child may choke on the cord or ribbon and suffer serious injury or death. If your child has suffered a choking injury from a window-cord that someone else has carelessly left within your youngster’s reach, you may be entitled to compensation for the injury your child has suffered and any associated medical bills. Please call our offices today at 877-875-2927 to speak with window-cord-choking injury lawyerJeffrey Killino for assistance in evaluating your case. Each year, over 2 million children are injured or killed as a result of mishaps from hazards posed by common household items. A method known as “childproofing” the home can help you prevent your child from becoming one of these unfortunate statistics. Child-proofing is simply an adjustment to the location or arrangement of household items to remove any dangers these items may pose to small children. Placing covers over wall sockets, for example, may prevent children from inserting something into the socket and suffering an electric shock. Compensation for injuries suffered as a result of window-cord choking may be pursued under a number of legal theories. One or all may be utilized, depending upon the circumstances of a particular case. The dangers posed by window cords to small children, including strangulation and choking, are well-know to manufacturers. If window treatments, such as blinds, shades, or draperies, include cords that are manufactured or designed in such a way as to pose one or both of these hazards, the manufacturers, distributors, and sellers of these products may be liable in damages for injuries suffered by your child as a result of the defect. The manufacturers and distributors of component parts, rather than of a window treatment as a whole, may be held liable under a product-liability theory, as well. If, for example, a separate company manufactured or designed the window cords that are attached to a particular brand of blinds, that company may be held liable under a product-liability theory if a defect in the cord’s manufacture or design is found to have been a cause of a child’s choking injuries. The manufacturer of the blinds, themselves, may be held liable under a product-liability theory, even if the defective cord that causes a child’s choking injury has been manufactured and designed by another company. 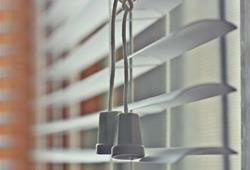 The blind manufacturer’s use of such a cord on its window blinds is enough to attach liability to the blind manufacturer as well as the manufacturer of the window-blind cord. If a child suffers a choking injury from chewing and swallowing a window cord, any individual or facility to whom the child’s care was entrusted may be found liable for injuries suffered by the child if the caregiver’s negligent supervision is found to have been a cause of the child’s choking incident. Negligence on the part of a caregiver may be shown, for instance, when an inattentive supervisor allows a child access to a window cord. It may also be established by demonstrating that the supervising individual or facility failed to take steps to put window cords out of a child’s reach. If your child has suffered injury or death as a result of choking on a window cord, you may be entitled to damages in compensation. Window-cord-choking injury lawyer of Jeffrey Killino has extensive experience with choking injuries and other injuries to children. The firm has brought suits against large corporations, including toy-manufacturer Mattel, Inc., to obtain compensation for families of children injured by their products. For more information or to further discuss the circumstances of a Window-cord chocking please contact Jeffrey Killino today at 877-875-2927 to speak him and have your questions answered.